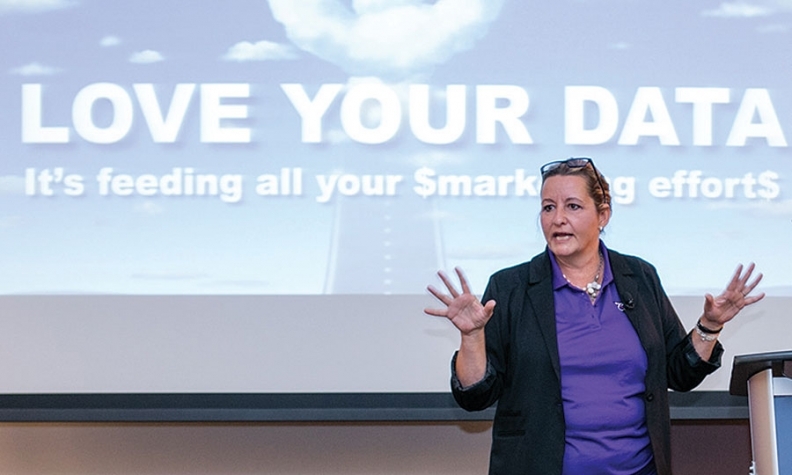 Janis Showers of The Car Girls advocates more love for customer databases; it needs to be constantly updated and nurtured and not taken for granted just because some technology is now in the picture. A specialist for dealership business-development centres sees profits slipping through their fingers and basic customer relations suffering, all from data-collection issues and misuse. Speaking at the recent DealerTalk Toronto conference, Janis Showers said that dealers are doing a great job collecting contact information through digital formats, such as pop-ups on their websites and software technology in the business office. But the consultant and trainer for business-development centres (BDC), and founder of The Car Girls, which offers call-centre and event-hosting services, also says that many dealers have no process or procedures to update these data bases when crucial customer information comes in through non-digital formats. As an example of dropping the ball, she said a customer called a dealership several times to change the contact name to his name instead of his wife’s because she died. It didn’t get done and he stopped coming. Another example was a service customer who spent thousands of dollars a year in the service department and was clearly due for a new car. But he was never referred to the sales department and when he stopped coming he couldn’t be contacted due to incorrect data. One more example was a person who sold their vehicle privately and wondered why the service department, many months later, was calling to promote maintenance services. Showers said the disconnect between sales and service is a major problem in database management and collection. Showers cautioned that when the data is wrong, phone and email-marketing efforts go for naught and in some cases it can even backfire. She also noted that updated information is even more crucial in this era of privacy concerns and laws, where businesses cannot solicit by email after 18 months of non-contact, and by phone after 24 months of non-contact. • A dealership’s BDC should be the bridge between variable and fixed operations; consider using it to handle all incoming calls (a common practice at United States dealerships), and to make contact with dormant customers set to fall off the active “can-call” list. • Use technology that automatically sends an email to test the addresses when they are first entered to cut down inputting errors. Find out what the bounceback rate is. The dealership could have a suspect process for collecting or confirming data. • Pay the showroom receptionist a small spiff whenever they collect contact data. schedules and don’t mind using their employer’s time for personal business. • Parts-counter staff are notorious for not collecting customer data. Ensure they do, especially for frequent and high-spending customers. • Service staff is typically spread pretty thin. Hire extra people during busy times, such as tire change-over seasons. • Use an ID scanner in the showroom for test drives. • Offer service customers with large repair bills a chance to get half back if they upgrade to a new vehicle. • For service work that has to be outsourced it’s better to open up a work order and sublet the work than to merely refer the customer to another shop. • When sending text and email, make sure they have links to the dealership website. • Follow up with car buyers who don’t return for service. • Make a yearly plan for email marketing efforts, coordinated between sales and service, so customer are not bombarded with offers all at once. • Listen to a sampling of the staff’s front-line phone calls every month.